The Funky Felter: Great Reasons to shop locally and buy handmade . . .
Great Reasons to shop locally and buy handmade . . . I thought that I'd share a portion of my notes from yesterday's "Shop Local" workshop on Etsy. These are some great reasons from Etsy Administration to shop locally and buy handmade. They are written in my own words. 1. Independent artists/crafters are more likely to invest money earned locally back into their own communities. 2. Buying locally from independent artists/crafters has been proven to cause less waste and depletion of natural resources. 3. Local independent artists/crafters offer more innovative products and are usually willing to go the extra mile to please customers. products than a chain store would be since the artist/crafter creates it themselves. They understand the process and what goes into each item produced. 5. Supporting local independent artists/crafters through buying locally provides a source of income so that individuals and families can better their lives and financial situations. 6. Successful local independent artists/crafters are an inspiration to those in their community as a whole and other fellow artists/crafters. 7. Buying locally from independent artists/crafters can only help flourish a community overall. 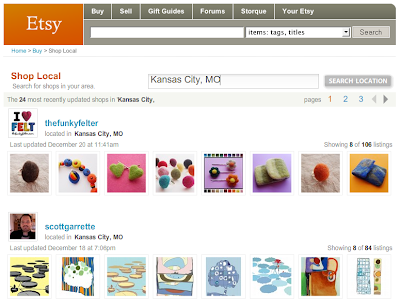 Etsy now has a great new search feature to help you find local artists/crafters to buy from called Shop Local. You can see an example of its search results for Kansas City, MO, in the image at the top of the post. It allow you to search for local Etsy sellers from any city or town in the world! Now go try it out!